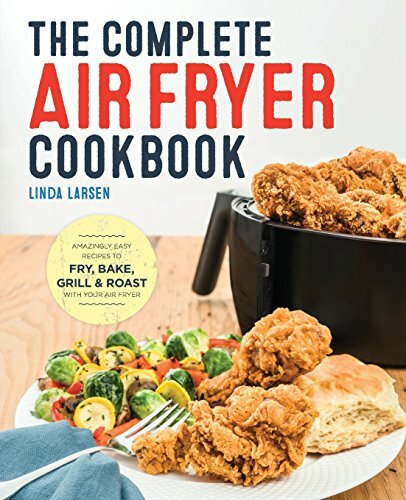 Have you used an Air Fryer yet? 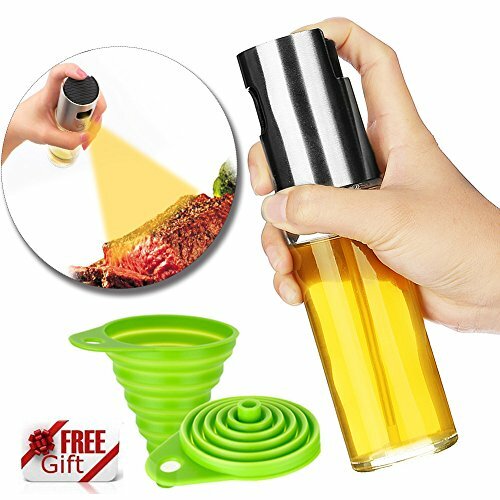 It is the perfect kitchen appliance to give you the crispiness and crunch from your favorite traditional fried foods without using oil. 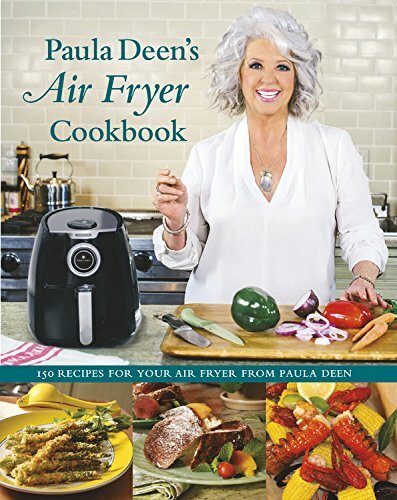 If you are not a fan of the extra oils and calories and looking for healthier alternatives to your favorite dishes and sides, then an Air Fryer is a perfect solution. 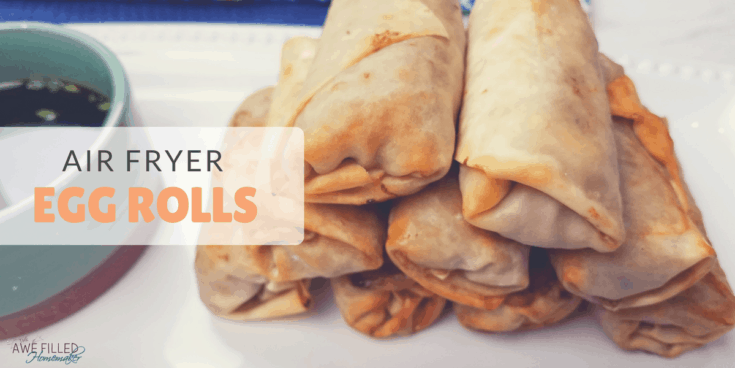 These Air Fryer egg rolls are packed full of delicious filling and have that light and flaky crust that offers that crunch when you bite into one. Grab your favorite dipping sauces and let’s get to cooking! It can be intimidating to roll an egg roll for the first time, but I promise it isn’t that hard. If I can do it anyone can. 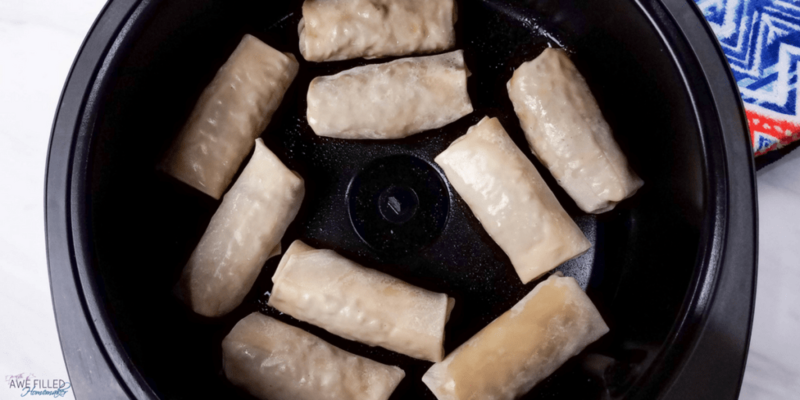 I make the filling for these egg rolls in my Instant Pot, which decreases the over cooking time. 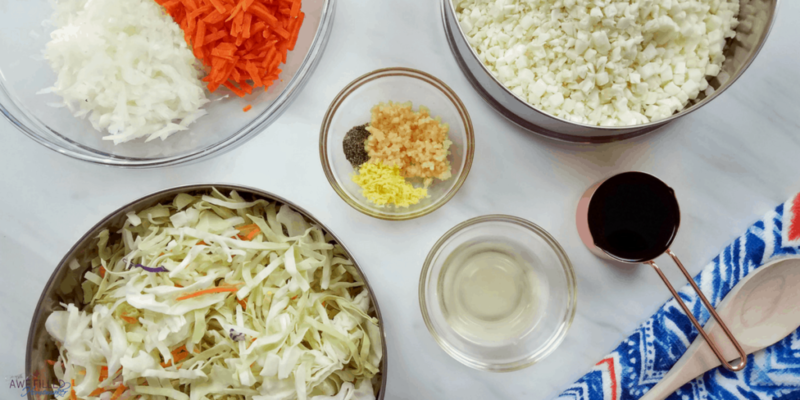 I also buy the bagged coleslaw mix, which saves a lot of time prepping these egg rolls. Also, you don’t lose any of the taste from the bag. Once I get the egg rolls assembled, I start cooking them. I lightly spray the Air Fryer tray with cooking spray and then I lay out my egg rolls. The hot air circulates and will cook the egg rolls in a quick time frame and provides the same crunch factor as if I deep-fried these egg rolls. 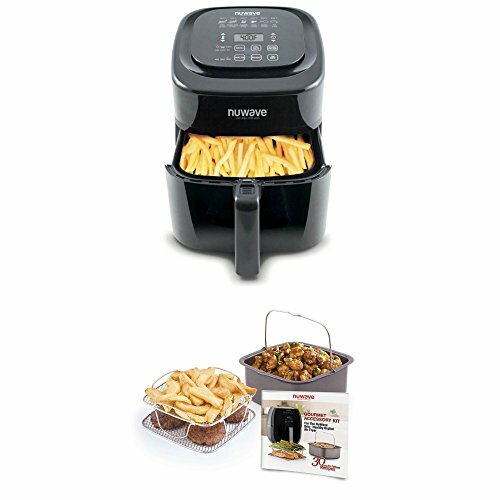 The Air Fryer allows a healthier option without lacking in flavor. 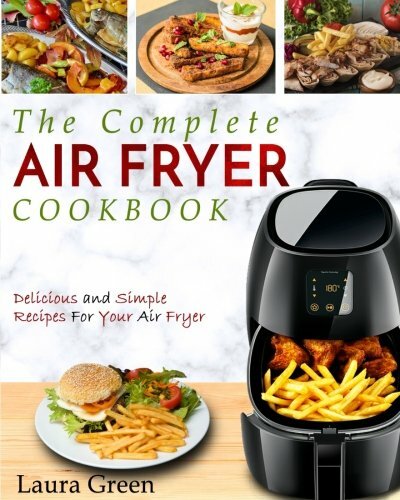 When I first bought my Air Fryer I wasn’t sure how often I would use it but knew it sure looked cool! However, between my Instant Pot and Air Fryer, I pretty much do all my cooking with these two appliances. They have made our lives so much easier and the cook times quicker. Both of these magic gadgets allows me to create healthy meals for my family. If you are on the fence about purchasing an Air Fryer, I highly recommend it. The versatility of this appliance is astounding. 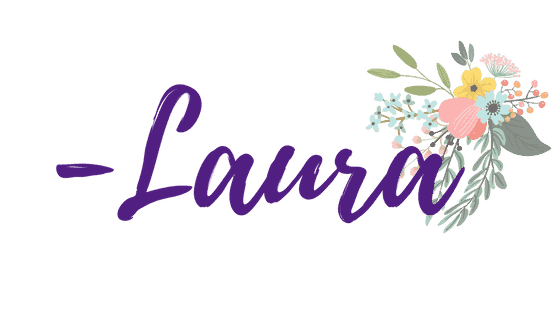 I can air fry desserts, main dishes, appetizers, and everything in between. The taste is amazing. The health benefit is amazing. The cleanup is a breeze. 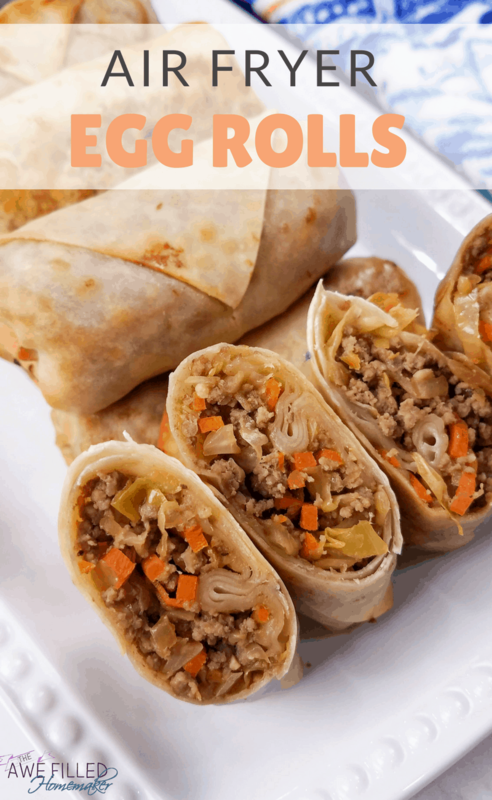 If you missed my recipe for Egg Roll in a Bowl in the Instant Pot, you will want to read that! I make the filling for my Air Fryer Egg Rolls right in my magic pot. 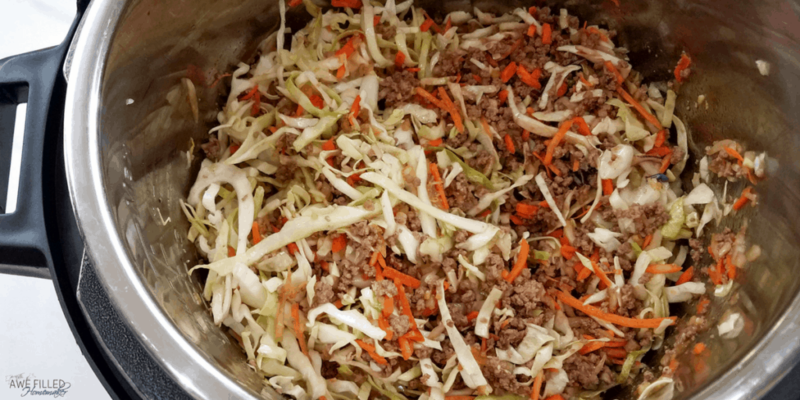 Egg Roll Filling Made in the Instant Pot. You can find the recipe here. 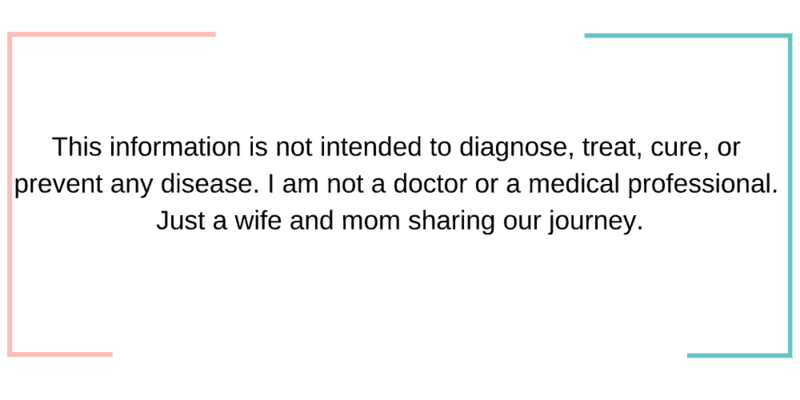 Spray mist oil that is safe for air fryers. 1. 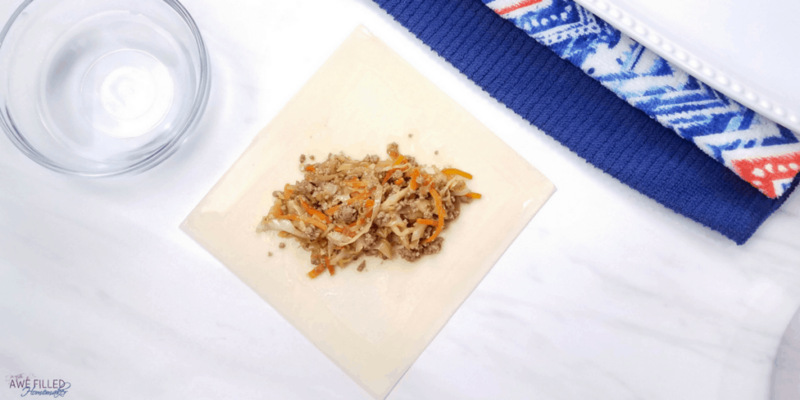 Follow the steps for making the egg roll filling the same as in the recipe for Egg Roll in a Bowl. 2. 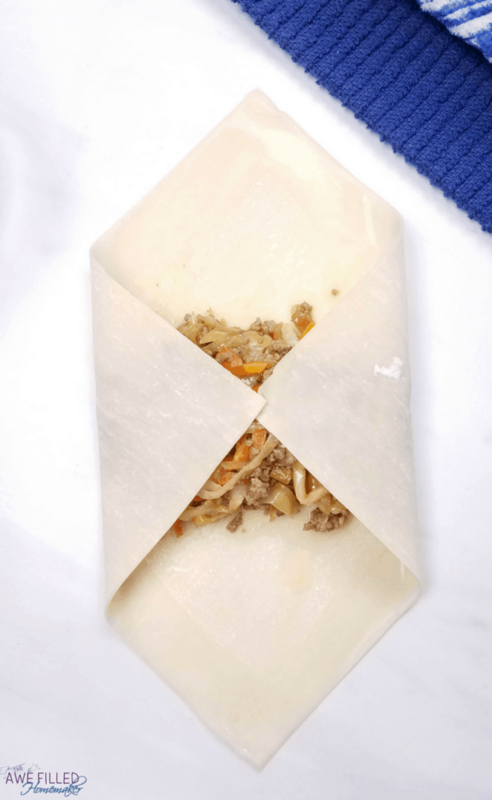 To roll the egg rolls, place a wrapper flat on a smooth surface with a small bowl of water. 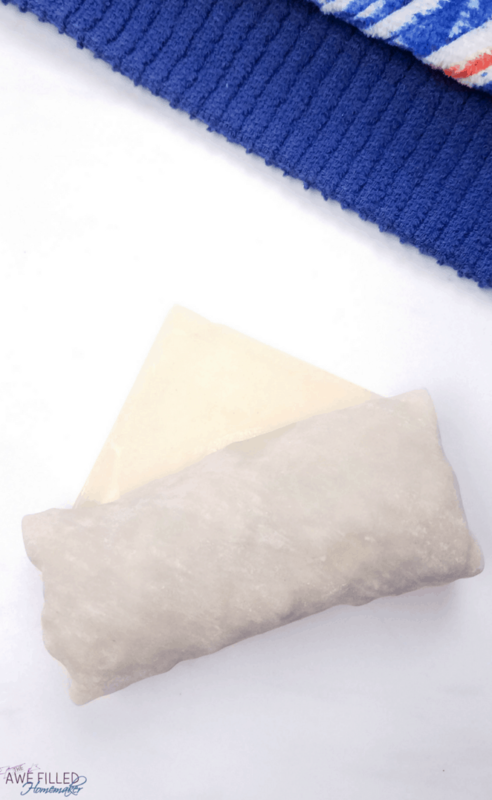 Dip your fingers into the water and then smooth the edges of the wrapper. Fill the egg roll with about 2 tbsp egg roll mix then roll it up making sure the sides are tucked in tight. The water on the edges will help the egg roll wrapper stay shut. If your egg roll ends are dry and coming apart, just add a little more water with your fingers. 3. Lightly spray the Air Fryer basket with coconut or olive oil. Arrange the egg rolls in the Air Fryer ensuring they are not touching. Cook the egg rolls for 6-8 minutes on 350 degrees. Next, turn the egg rolls over and cook for another 6-8 minutes. 4. Allow the egg rolls to cool for at least 10 minutes before serving with your favorite sauce for dipping. These Air Fryer egg rolls are packed full of delicious filling and have that light and flaky crust that offers that crunch when you bite into one. 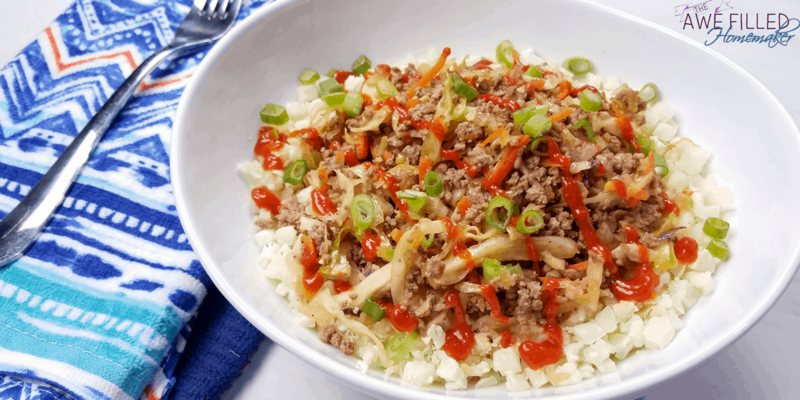 Follow the Egg Roll In a Bowl Recipe for the Instant Pot. After step 1, remove the lid and give the egg roll mix a good stir. Drain the extra sauce, this make it easier to roll the egg rolls without getting too much sauce in the wrapper. 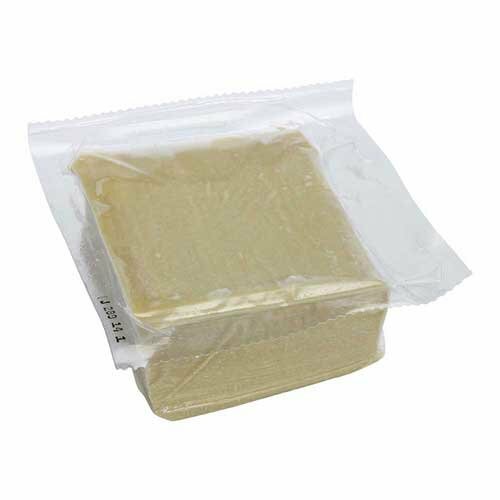 To roll the egg rolls place a wrapper flat on a smooth surface with a small bowl of water. Dip your fingers into the water and then smooth them over the edges of the wrapper. Fill the egg roll with about 2 tbsp egg roll mix then roll it up making sure the sides are tucked in tight. 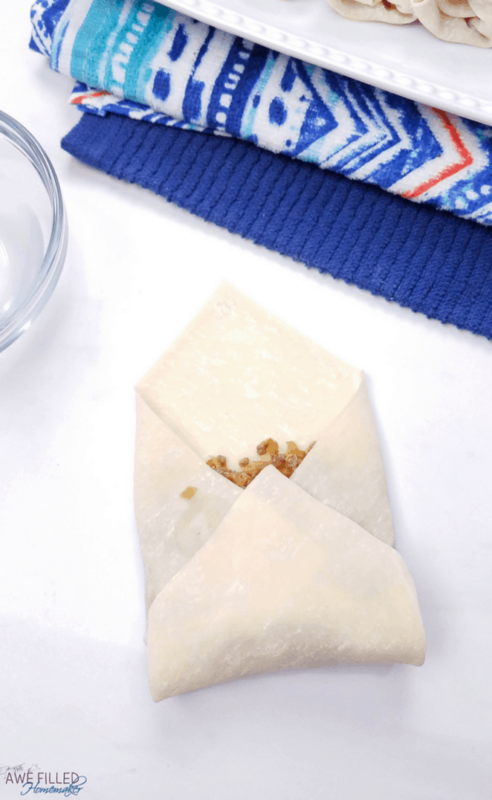 The water on the edges will help the egg roll wrapper stay shut, if your water had dried just add a little more with your fingers. Lightly spray your air fryer with coconut or olive oil. Arrange your eggrolls so that they arent touching in the air fryer. Cook the egg rolls in the air fryer for 6-8 minutes on 350 and then turn the over and cook for another 6-8 minutes. When done let the egg rolls cool for at least 10 minutes before serving with your favorite sauce for dipping.Enjoy!